I believe the Holy Spirit has just exposed Satan’s plans against Israel through an Iranian general’s boasting. 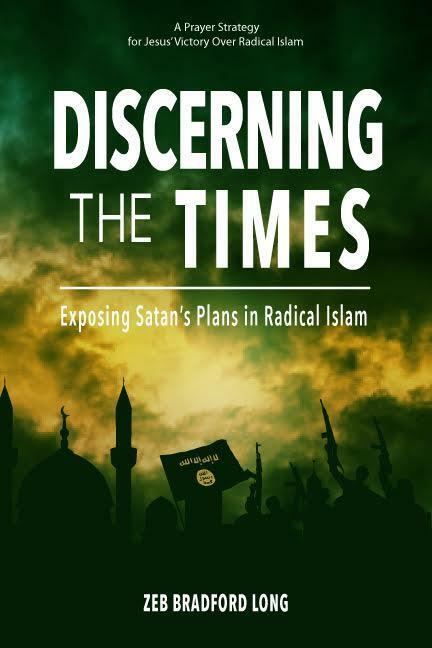 I recently read an article in Jihad Watch by Robert Spencer. In his article he discusses another article about the Iranian general which originated with the Times of Israel. When I read Spencer’s article, the Holy Spirit fell on me and called me into an engagement to block the implementation of Satan’s plans to destroy Israel. The Lord has also provided intelligence to guide us in how we are called to cooperate with the Holy Spirit in thwarting those plans. The timing is urgent. I invite you to join me. Now here is what I was shown. Spencer highlights the following from the Times of Israel article. “Top Iranian general: Forces in Syria ‘awaiting orders’ to destroy Israel,” Times of Israel, July 9, 2018. “In a recent speech, the deputy commander of Iran’s Revolutionary Guards (IRGC) boasted that the ‘Islamic army in Syria’ in the Golan Heights was awaiting orders to eradicate the ‘evil regime’ of Israel. “He also said the Tehran-backed Hezbollah terror group had 100,000 missiles aimed at Israel. If you wish, you can read the original article in the Times of Israel and Spencer’s article commenting on it in Jihad Watch. Through the Iranian general’s boastful words I believe the Holy Spirit has exposed the following important facts. First, the situation on the ground with Israel’s enemies. Iranian forces have built up in Syria and are well-armed with 100,000 missiles. In addition, Hezbollah in Lebanon is a real and very dangerous threat. Second, Israel has carried out a number of recent attacks against Iranian military assets in Syria. The situation may be escalating, or has already reached, a point where the Iranian Supreme Leader, Ayatolla Ali Khamenei, could order an attack on Israel. Third, the General’s boasting suggests we are in the time frame for launching an attack. The likelihood of an attack becomes more imminent with each day that Israel degrades Iran’s assets in Syria. Fourth, the general’s voicing that he is waiting for orders reveals a chain of command, which is both human and demonic, behind what we see happening. Though the Iranian general may be bluffing, the public exposure of these facts by Iranian leadership suggests the strong possibility that the Israel Defense Force may move preemptively to destroy the threat before it can be unleashed against Israel. All of this suggests that Satan is setting things up for great evil. While many other critical prayer battles are taking place right now on many levels, this particular battle is strategic to the fulfillment of God’s plans through Israel. To fulfill God’s plans, the nation and people of Israel must not be destroyed. Each of the public revelations which I mentioned may provide guidance for you in prayer. The Holy Spirit is calling me to focus prayer on disrupting the chain of command along which would pass the order to unleash this massive attack against Israel. My prayer is to either prevent the order from being given or to delay it long enough that Israel can ameliorate the effects of the attack. Disrupting the Chain of Command That Passes Down Through Each Battle Space. Satan’s chain of command extends from the first battle space, the high-level demonic powers over Iran, down to the second, and then to the third battle spaces, both of which incorporate human beings. So far in the first battle space, I have not been called to engage the high-level demons. But I have been asking the Lord to expose who they are. I have received only general guidance at this point. An intercessor has mentioned there seems to be some danger in identifying these high-level demons. If anyone is getting guidance on the nature of the danger or on the identity of these high-level demons, please pass that on. The Lord has been leading me to focus on Battle Space Two, which is the interface between the demonic spirits and the human leaders through whom they work. As I pray, I am using as a visual guide the following picture from a Times of Israel article, taken in Tehran, Iran, on May 20, 2015. 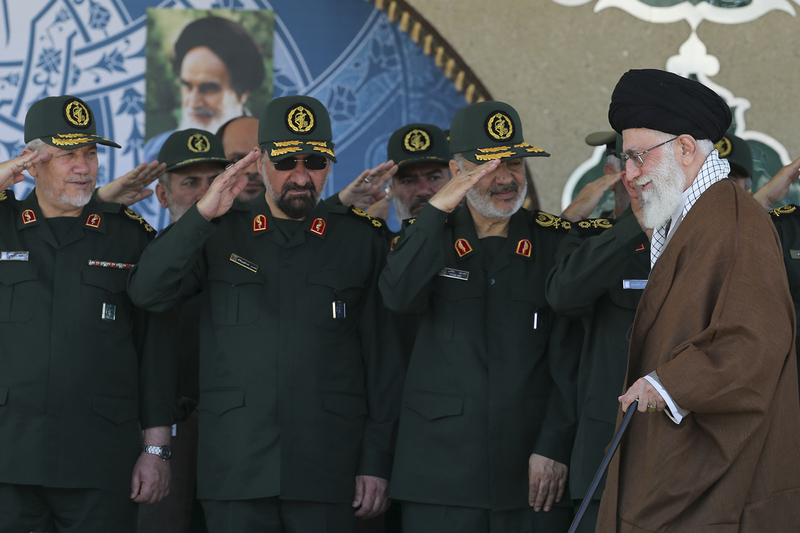 Iranian Supreme Leader, Ayatollah Ali Khamenei, right, arrives at a graduation ceremony of Revolutionary Guards officers. Deputy Commander of the Revolutionary Guards, Hossein Salami, second right, is the one who I think is making these threats. Second left and left are former commanders of the Revolutionary Guards, Mohsen Rezaei and Yahya Rahim Safavi. 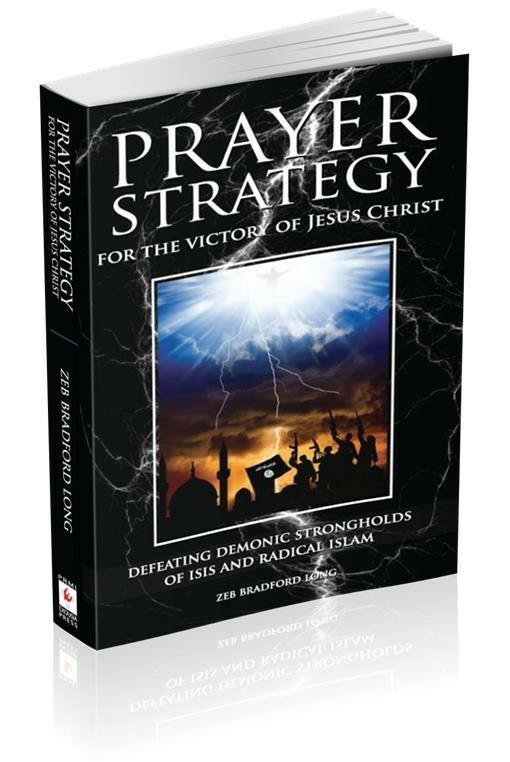 Guidelines for Praying into the Second Battle Space. Ask the Holy Spirit to guide you as you pray. Pray that those demonic powers who have access to Supreme Leader Ayatolla Ali Khamenei will be cut off from him. Pray that the commands to Ayatolla Ali Khamenei from the supreme leader of hell, Satan, will be blocked. Pray that the Lord will so confuse the channels of communication between Khamenei and the gathering “International Islamic army” that the sequence of events needed for an attack to take place will be completely disrupted. As I pray while viewing the picture, in my mind’s eye I see everything breaking down between Khamenei, who would give the orders, and the row of commanders who would actually implement the attacks. This engagement seems to be intensifying. Is the Lord calling you in the same way? Or are you hearing other tactics he is calling us to deploy? Please let Martin and me know right away about any guidance you receive. As I read your update Brad, I was brought to Isaiah 54. There is so much in this chapter that needs to be ubpacked, looked at and prayed into the reality for the protection of Israel and its people! It will take me a while to lay that out as this week is busy with what God has before me here. However, I want to get this part out there so the listening prayer of the body of our intercessors can have at it! And we all know the outcome here so I speak this to the enemy from under the cover of the blood of Jesus also including all my family and families families, those of whom I live and work with and all ministries I’m associated with. Praying! As I read your article the Holy Spirit has come upon me in a burden to pray in tongues for Israel. I agree with the guidance to disrupt the demonic and earthly command connections around this man. My prayer guidance in recent weeks has been “cut off the head of the snake”. Perhaps that means cut off the demonic communication…break the open channel with whatever form of interference needed. This General is very popular, much more popular than the president to Iran according to some reports. This could mean trouble for him or for President Rouhani. In any case, this general is a good strategic focus for our intercession that the destructive forces and plans of the enemy be restrained and many lives spared and given opportunity to come to the Lord. I am praying Psalm 118 with emphasis on verses 10-16. “In the name of the Lord, I cut them off! All evil plans towards Israel by the Iranian leaders, I cut them off. Though they may surround on every side, in the name of the Lord, I cut them off so they no longer surround. Though they swarm like bees around Israel with evil plans I cut them off and those plans died as quickly as burning thorns. In the name of the Lord I cut them off. I am praying that the Lord will disrupt the coalition gathered against Israel, pitting them against each other. I am also praying that the Spirit of the God of Israel will strike terror in the hearts of her enemies. I am commited to prayer later today and so may change part of my prayer time to pray for Israel. My thoughts are you are correct and I will be engaging later and I think it important to remember to pray for protection for all those deep in prayer. I ask we all remember to ask for protection to all concerned today and any discernment received. Wall Street Journal mentioned the general in a short editorial November 5. Someone is paying attention.